← Need Price list for HTML to PDF Converter for Java. How to call htmltools.exe from Java source code? You can use PDF Content Splitter Command Line software to search text contents in the PDF pages, get the X/Y position for a keyword, and then split this PDF file to more PDF files by this position. This entry was posted in @VeryPDF News, VeryPDF SDK & COM and tagged content splitter, pdf content splitter, pdf split, split PDF. Bookmark the permalink. How to split a large PDF into multiple documents with keyword? Split PDF based on keyword? 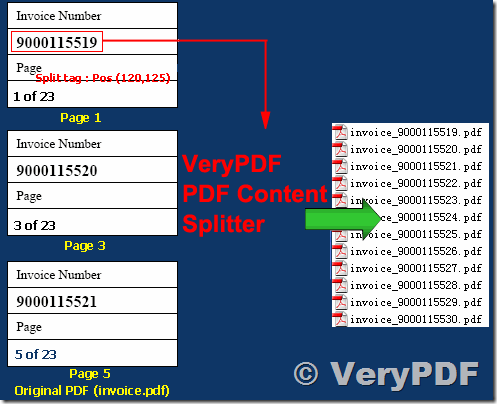 VeryPDF PDF Content Splitter can be used to split PDF files by different text or same text in the same position. VeryPDF Releases PDF Content Splitter Command Line software today, split PDF files based on content.